Cool off with this simple frozen dessert of V8 Splash and champagne topped with fresh fruit of the season. mango	 70 oz. 3 qt. 2. 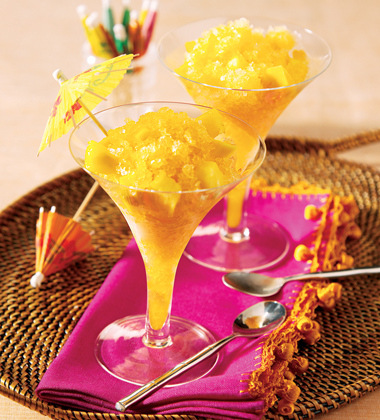 For Each Serving: Scoop 1/2 cup Tropical Champagne Ice into bottom of a stemmed dessert glass and top with 1/2 cup fresh fruit mixture. Garnish each dessert with a sprig of mint to serve. Garnish Options: Other fresh herbs may be used instead of fresh mint including: rosemary, thyme, lemon balm, fennel, basil, etc. This dessert may be scooped out ahead and frozen in dessert dishes and just topped with fruit and garnish right before serving.